After a relaxing stay at the exquisite El Encanto Resort, the thought of getting into my car for a two-hour drive home, possibly in some traffic, didn’t excite me. I was thrilled to be taking the Amtrak Surfliner home. My family and I were invited to experience the Orient Express’ newest 5 star resort, the newly renovated El Elcanto. We drove up on a Sunday together. After enjoying a decadent afternoon-tea on the Terrace, swimming in the 85 degree infinite pool and touring the grounds of the resort, my family needed to drive back home, due to work and school obligations. As I watched them leave the driveway, I went back to my cottage and slept well. The next morning I ate a dazzling California-style breakfast prepared by Executive Chef Patrice Martineau. Later I enjoyed a marvelous facial by Kelsey Webb at the El Encanto Spa. Afterwards, El Encanto staff members arranged for a car to take me down to the Santa Barbara train station. It’s only ten minutes away. The staff happily printed out my boarding pass for me for my 2:04 p.m. departure. The train was eight minutes delayed due to a freight train trying to pass. At 2:10 p.m. it arrived. Everyone in the train station, built in 1904, walked onto the platform and into the various train cars. I followed other passengers up the stairs and found a window seat to admire the Pacific Ocean views. There was a foot rest, fold out tray and my comfortable chair reclined back. 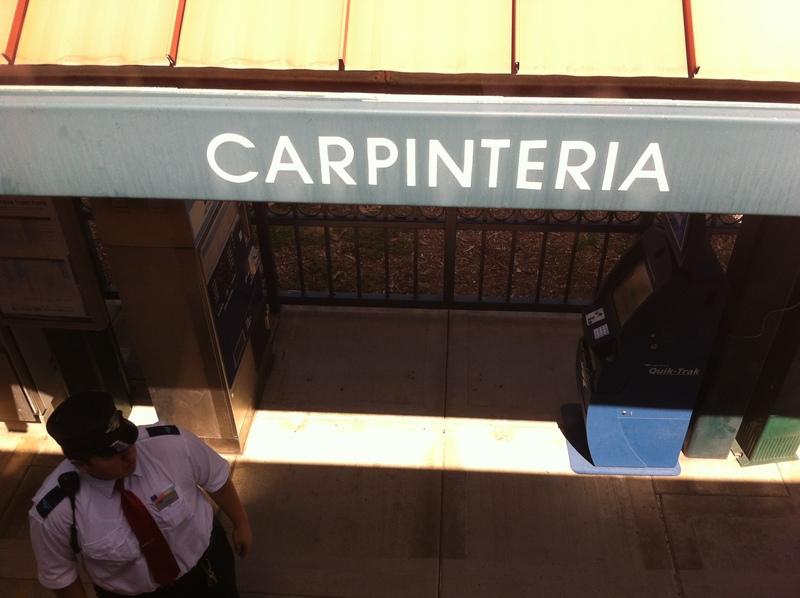 The conductor scanned my e-ticket before we rolled up to the Carpenteria station 15 minutes later. Along the way, I took photos of beaches, multi-million dollar Montecito homes and the Four Seasons Biltmore Hotel. We smoothly stopped in Carpenteria and picked up a few people, before we continued on our journey to the Ventura station. Kids waved to us as our train went by. The 20 minute journey to Ventura was mostly all ocean viewing. Everyone in my train car was quiet. We all enjoyed hearing the horn sound out every few minutes. Passing oil rigs in Carpenteria and wonderful nature trails along the cliff, as waves gently crashed along the shore. Couples stopped along their beach walks to admire the beauty and length of the train. We clickety-clacked along the 101 freeway before passing Mussel Shoals. Workmen were working in the center of the freeway. We passed flocks of seagulls standing in shallow water and a long line of RV’s parked along the coast. Trees of every species passed by my window: California pines, Queen palms, Nobel fir. A motorcyclist kept pace with our train right before Ventura. He turned and waved. The ride was fairly smooth and so picturesque. I’ve never appreciated the California coast line as much as I did riding the train. When driving on the freeway, cars, trucks and motorcycles pass by and distort your view. 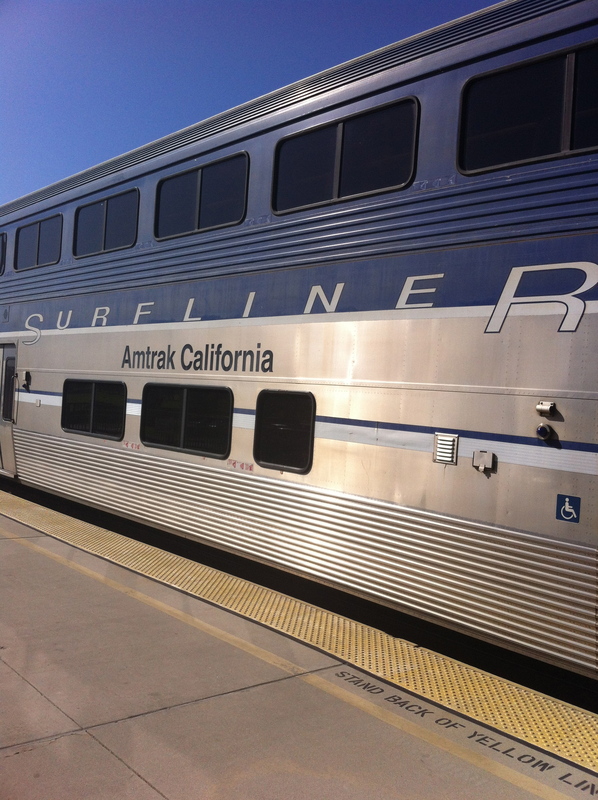 On the train, it’s a moving picture of California’s quintessential lifestyle. Flocks of pelicans soared overhead as we approached the Ventura Fairgrounds and train station. After a brief stop we slowly rolled out of beach viewing Ventura to the more inland route to Oxnard. The conductor said it would take us 12 minutes. With the ocean in the far distance, we passed the Pierpont Tennis Club. Next fields of green cabbage, lettuce, and orchards of citrus fruit. Workers were harvesting the fresh produce for the local farmers. There is a Café on the train, however I brought my own food and didn’t want to miss the view. Restrooms are on located near the stairway. At Oxnard, the sign stated Elevation 61 feet. There is a large bus depot next to the train station. Oxnard’s annual Strawberry Festival is May 18 and May 19th. We passed a lot of strawberry fields on our way to Camarillo in ten minutes. Next stop, Moorpark in 10 minutes. 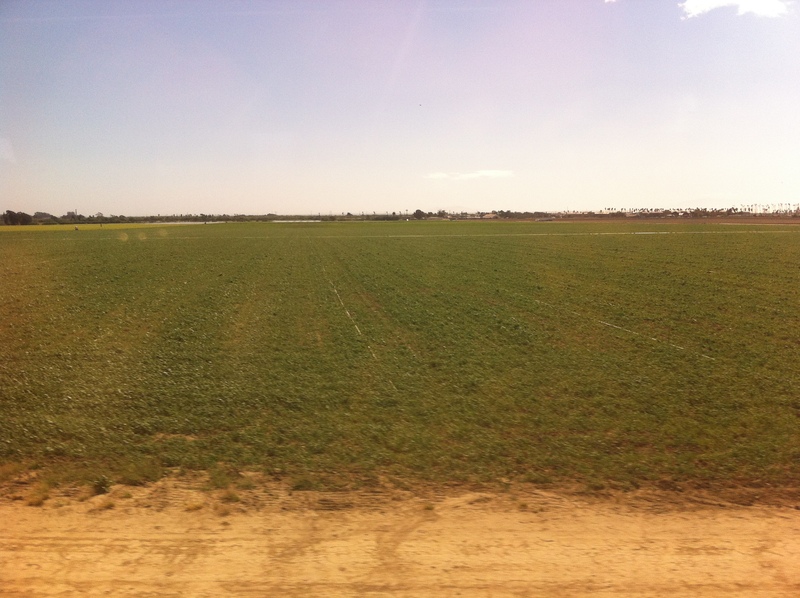 Now we cruised by industrial parks and then fields of beans, groves of lemons into the Santa Rosa Valley. Horses in corrals rested under tall eucalyptus trees. More lemon and orange groves and workers harvesting acres of crops. Arriving into the Moorpark station we passed a skateboard park and elementary school. 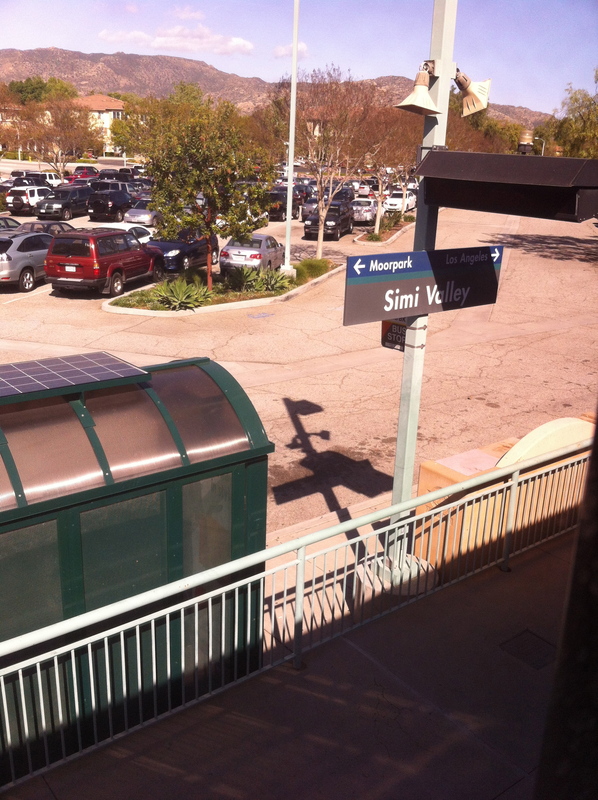 As the doors closed we were headed to Simi Valley. Arrival time about 15 minutes. The views weren’t as pretty as earlier on the journey. We passed a batting cage, Law offices and cars lined up at a signal along Los Angeles Ave. Passengers boarding the train started talking on their cell phones and others blared music so loud into their earphones, that I could hear the heavy metal music six seats away. The Southbound train’s next stop was Chatsworth, ten minutes away. The topography is beautiful rolling through the Santa Susana pass. Rocks and boulder are dominated by high, narrow ridges and deep canyons. 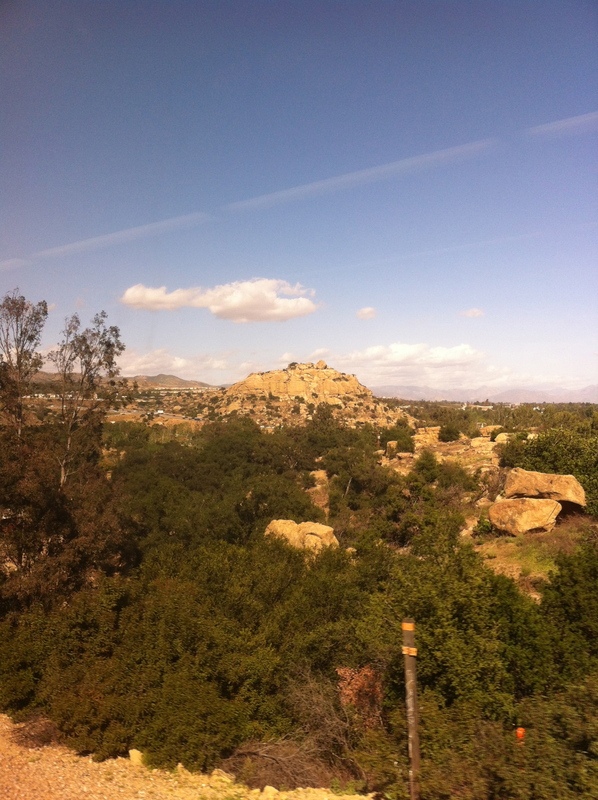 The rugged natural landscape was a striking contrast to the developed communities of Moorpark and Simi Valley. We even went through our three tunnel. Inside the car the lights remained on, yet outside was pitch black. According to a website, the first tunnel is 7,369 feet long. It was constructed in 1900 by the Southern Pacific Transportation Company and completed in 1904. Construction of the tunnel began in 1900 by the Southern Pacific Transportation Company and was completed in 1904. It made it easier to transfer crops and livestock to market. We traversed through another shorter tunnel before seeing more Rocky peaks. In fact, the third highest point is called Rocky Peak. It gets its name from the many large craggy boulders that dot its surface. It’s quite beautiful and unique to another landscape we rolled past. Rocky Peak has been prominently featured in many classic films. Cruising through the last tunnel, we saw Equestrian estates and track homes in Chatsworth. It was the first time another train passed by my window. 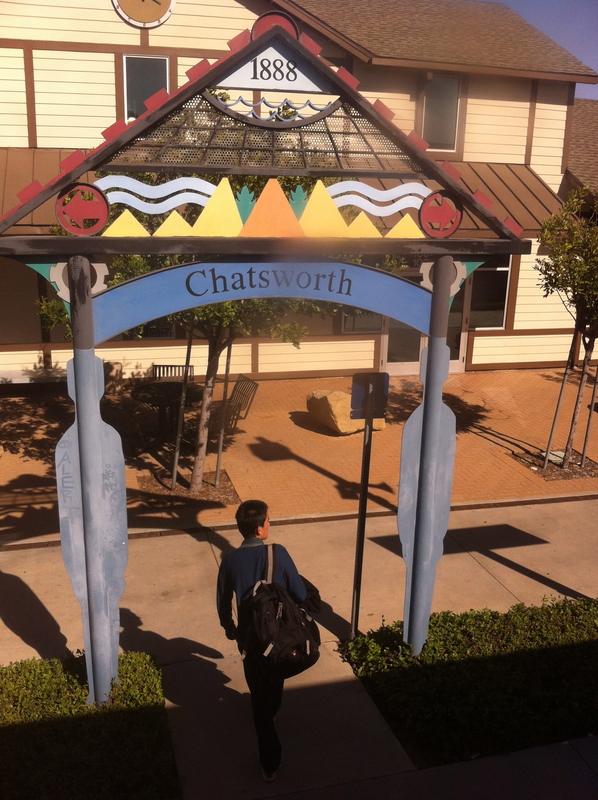 The Chatsworth station had the nicest arrival sign. The depot offers passengers a Transportation and Movie History museum to explore. Next stop, Van Nuys with a 15 minute travel time. We passed the Van Nuys airport and watched the private jets, small planes and helicopters take off and land. We saw a lot more cars, trains and billboards. We were told the train might fill up with commuters, so place our bags and items in the overhead shelf. The conductor came by to tell me my stop at the Burbank airport was next and would take about six minutes. I packed up my things and got ready to leave my relaxing journey. The train only stops for a minute or two, before closing its doors and heading out to its next depot and final destination, San Diego. 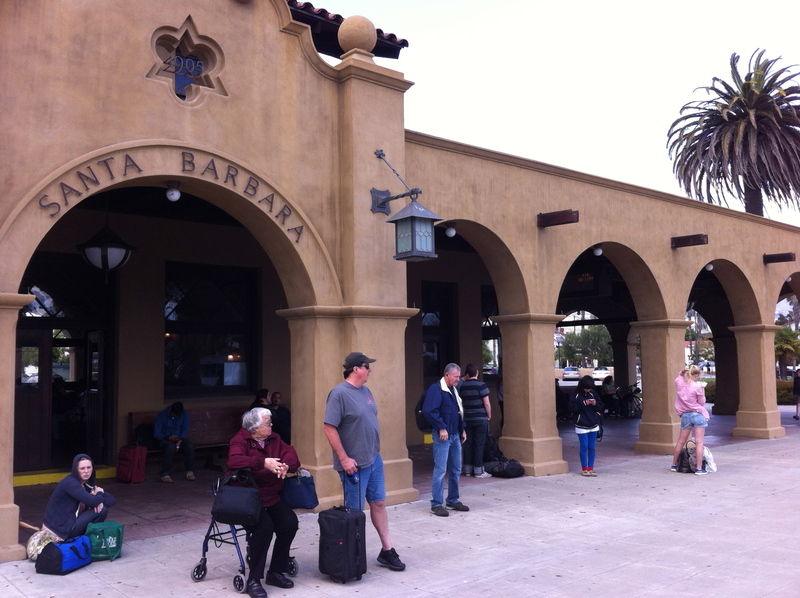 I longed for the tranquil and serene views of pulling out of the Santa Barbara Train Stations and rolling along the coast, yet enjoyed the unique views that each city offered along the train tracks.